Greek amphora, 4th century B.C. (Latin plural, amphorae.) In the Classical world, a unit of capacity. The Roman amphora was about 26.2 liters, and the Greek was 1½ times the size of the Roman. 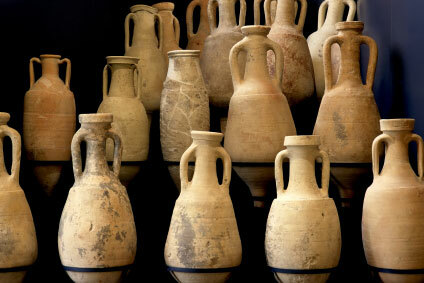 The amphora was both a unit and the name of a container for oil, wine and other liquids in the ancient Mediterranean. The container itself was the classical world's equivalent of the 20th century's ubiquitous 55-gallon steel drum. Mediterranean underwater shipwrecks often contain row after row of amphorae. In Rome, a site called “Pot Mountain” consisted mostly of the shards of hundreds of thousands of amphorae. An amphora had a narrow neck, two handles at the top like today's acid carboy, a plump middle, and usually a pointed bottom that could be pushed into soft earth or easily stacked in the hulls of ships. Some were made with bases so that they could stand upright on a flat surface. The prize at the Olympics was such an amphora, filled with olive oil and painted by a master, treasured then as they are now in the world's museums. Amphoras did not necessarily contain 1 amphora, the unit of capacity. In Roman times an amphora was equal to 36 sextarii, or 72 hemine, or 288 acetabuli, but in the middle ages (as in Greek times) it equalled 48 sextarii, or 96 hemine, or 384 acetabuli. Isis, vol. 24, no. 1 ("December 1935). The Ancient World On Line provides an index to scholarly sites dealing with the amphora as object. W. Kendrick Pritchett and Anne Pippin. The Attic stelai, Part II. Hesperia: The Journal of the American School of Classical Studies at Athens v.25 no. 3, pages 195-196. 1956. Standard pottery containers of the ancient Greek world. Commemorative Studies in Honor of Theodore Leslie Shear. Metody issledovaniya antichnoy torgovli (naprimere Severnogo Pricernomorya). Last revised: 14 February 2017.